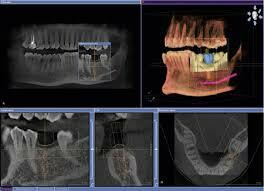 X-rays are an important part of your dental treatment when you visit the dentist. Dentists use x-rays to check for hidden decay, monitor wisdom teeth and for a variety of other important reasons. At Winneconne Family Dentistry, we use the latest in 3D digital x-rays to provide quality and convenience for our patients. Digital x-rays generally have a higher resolution than traditional film x-rays, allowing Dr. Ryan to better catch problems. Additionally, Dr. Ryan can zoom in on these x-rays and point out any issues he finds. Digital x-rays also have much less of an environmental impact versus traditional film x-rays. There is no film or cartridges to dispose of and no dangerous chemicals are used to develop the film. The images are simply stored digitally on our computer system. Film x-rays also use more radiation than digital x-rays. While the level of radiation is relatively low for both systems, digital x-rays can use up to 70% less. Of course, the less radiation, the better. Finally, our use of digital x-rays allows us to serve our patients faster. There is no waiting for films to be developed and less need for re-shoots with a digital setup. Winneconne Family Dentistry has high-tech equipment to better care for you, our patient. For an appointment, please call (920) 582-4427 now.